Loft is a term typically used to refer to an industrial-looking apartment with high ceilings where the plumbing and duct work for heat and air conditioning can be seen. The unit might be split level with a bedroom accessed by stairs or ladder that overlooks the remainder of the apartment. Heat rises, making the upper portion of any room hotter than at floor level. The measures taken to cool a loft are not dissimilar to the steps taken to cool any room. Close the blinds and drapes during the day. You will not only be blocking out the sun, you will also be providing some insulation against the outdoor heat that warms the window. Turn on the air conditioner (central air or window air conditioners) and place the fan setting to always be on during the hottest part of the day. That will keep the air circulating. You can turn the A/C to the auto-fan setting on less oppressive days to conserve energy. 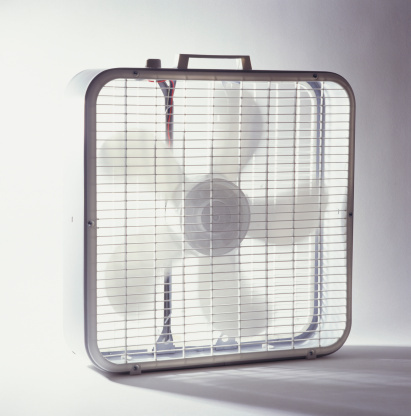 Use box fans (about 30-inch square), placed strategically on the floor throughout your apartment to help circulate air. 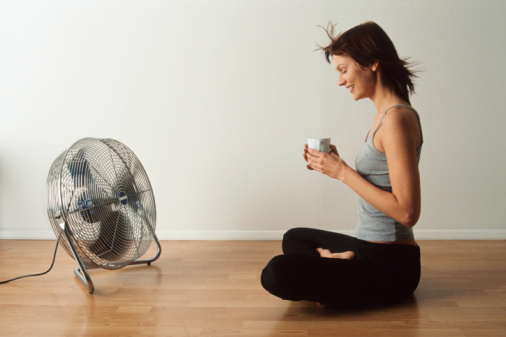 For instance, near the A/C source, place a fan on the floor to push air to the next room or living area. Install paddle ceiling fans, which force warm air down and draw cooler air up. Ceiling fans have the capacity to spin clockwise or counterclockwise, which affects whether the fan is pushing air down or pulling air up. There is either a specific pull cord for that feature or there might be a switch on the core of the fan. When the fan is on, feel whether the air movement is directly below the blades or coming from outside the diameter of the blades. You want the latter because that means cooler air from the floor is being pulled upward. If the air flow is coming straight down from beneath the fan, turn the fan off, wait for the blades to stop spinning, reset the blade direction with the switch or pull cord, and then turn the fan back on to at least a medium speed. In winter, the fan direction should be changed to force the warmer ceiling level air downward. Use window and box fans if you don't have air conditioning. The objective is to bring cooler, outside air during the night. To accomplish that, at night, place fans in open windows on the same wall so the fans face inward. Place additional fans directed inward in the windows on the opposite wall (or adjacent wall). The inward fans are best suited for use in sleeping areas. Fans placed in this fashion will pull cool air in from one side of the apartment and out the other side of the unit. During the day, place fans pointing outward in windows on the south or west side to continue to draw hot air out, and close blinds or affix drapes to cover the window above the fans. Remove fans from any other windows so they can be closed and covered by drapes or blinds. Eliminate or reduce the use of heat and humidity production during the hottest part of the day. Using the oven, dishwasher or clothes dryer will contribute to heat buildup, and showering and cooking will contribute to higher humidity. Though taking these measures will not cool a loft, they will help to prevent an increase in heat and humidity.